7. Lennox Lewis: In the midst of the Tyson-Holyfield-Bowe era, there was Lewis – a 6-5 roadblock with an educated jab, a powerful right cross and a chessmaster’s mindset. He had the physique and the skills to blow out opponents – as it was he had 32 knockouts in 41 wins – but his cautious nature got in his way in terms of marketing and mass appeal. Lewis chose to ignore his critics and stayed true to himself. The results, in turn, spoke for themselves. He was the first British-born man in a century to capture a piece of the heavyweight title and in all he enjoyed three separate reigns. If one includes amateur wins, he holds victories over all three of his major rivals. Finally, he retired on his own terms, joining Gene Tunney and Rocky Marciano as the only heavyweight titlists to ever retire – and remain so – while still champion. As Lewis will probably tell you, it’s nice to have the final word. Olympic career – Lewis actually took part in two Olympics. 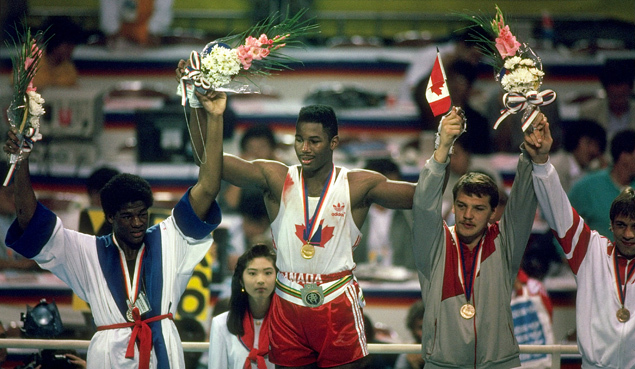 In 1984, the 18 year old knocked out Pakistan’s Mohammad Yousuf in three but lost a shutout decision to eventual gold medalist Tyrell Biggs in the quarterfinals. Four years later, a more mature Lewis dominated, knocking out Kenya’s Chris Odera in two, East Germany’s Ulli Kaden in one and receiving a walk-over into the finals when Poland’s Janusz Zarenkiewicz bowed out. Lewis’ opponent in the super heavyweight final was Bowe, a talented but scattered sort who knocked out Ikonomonya Botowamungu in two and Czechoslovakia’s Peter Hrivniak in one before decisioning the Soviet Union’s Alexandr Miroshnichenko 5-0 in the semis. The first round was entertaining, with Lewis reaching Bowe with several long rights and “Big Daddy” working well at close quarters. Bowe lost a point for butting late in round one but Lewis rendered that math moot when a series of power shots netted a standing eight-count early in round two and a huge overhand right moments later forced the stoppage. Professional career – Lewis ended his 14-year pro career with a 41-2-1 record, a mark that could have been 44-0 had the judges correctly rendered his first fight with Holyfield as a victory instead of a scandalous draw and had Lewis been fully engaged in his preparations for his first fights against Oliver McCall and Hasim Rahman. As it is, Lewis avenged all his blemishes and he is one of a handful of fighters who enjoyed three reigns as a heavyweight titleholder. Lewis was 15-2-1 (10) in title fights and his victims beyond those already mentioned include Vitali Klitschko, David Tua, Frans Botha, Michael Grant, Shannon Briggs, Zeljko Mavrovic, Andrew Golota, Henry Akinwande, Ray Mercer, Tommy Morrison, Frank Bruno, Tony Tucker, Donovan “Razor” Ruddock, Mike Weaver, Ossie Ocasio and a revenge KO win over ex-Olympic opponent Biggs. When he occupied a stage where legacies are at stake – the two Holyfield fights, the Ruddock match for what would be the WBC title vacated by Bowe, the Rahman rematch and the Tyson bout – Lewis rose to the occasion and performed accordingly. Besides the millions in purses, Lewis’ reward was Hall of Fame induction and an everlasting place in heavyweight history.